Cell Phone Jammers Work ? In order to better understand how a Cell Phone Jammer works, it is beneficial to first understand how your cell phone functions. In short, every cell phone utilizes two different frequencies. One of the frequencies is used to transmit information, while the other is used to receive information. Regardless of the frequency used, the signal must first originate from one phone, and then get sent to the base station. From the base station, it is relayed to the receiving cell phone. When you use a Cell Phone Jammer, the signals transmitted by the cell phone actually collide with the signals transmitted by the phone jammer. When the two signals collide, they are essentially canceled out, and the link between cellular base station and cellular handset is disconnected - providing the cell phone with no service / no signal. When the cell phone jammer is turned off, the cell phone signal is instantly returned. As a result, the cell phone user is unable to make or receive phone calls while the cell phone jammer is turned on. Additionally, any calls in progress will be disconnected when the cell phone jammer is turned on. In order to block out a desired area, it is important to choose the right type of Cell Phone Jammer. Some are able to transmit signals in a far larger area than others. Many of our competitors products, which are actually considered novelty items, only transmit over a 2 meter (6 foot) area - therefore, you need to assess your needs and the amount of coverage desired, so that you can select the cell phone jammer that is right for you. Do You Know Why Others Use Cell Phone Jammers? When you hear about cell phone jammers, you might have an initial overall negative impression. After all, why would someone want to cut off the communication of cell phone users? 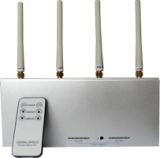 The reality is, there are many reasons to consider using a cell phone signal jammer -- and within a variety of settings. One place where cell phone jammers can be particularly useful is at a school or university. By blocking cell phone signals, students cannot become distracted by their phones. In addition, they cannot cheat by sending text messages to one another during exams. High security locations, such as prisons and detention centers, can also benefits from cell phone jamming because it can prevent illicit communication between inmates and visitors. Please see This Article from CNN. Of course, a cell phone jammer can also be beneficial in places such as a movie theater or a library where other patrons expect silence, so they can enjoy their activities. Please note that cell phone jammers are not intended to harm. In fact, even when jamming cell phone signals, emergency services frequencies are not disturbed. So, to give yourself and your patrons the peace and quiet they deserve while still allowing those in your building or facility to remain safe, get a cell phone jammer. Do You Know How Your Mobile Phone Jammer Is Made? Although cellular phone jammers are quite simple to operate and do not have many visible components, they do have a number of highly technical components on the inside that make it possible for them to get their signal jamming job done right. 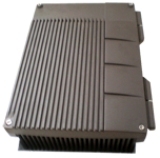 The voltage-controlled oscillator on a mobile phone jammer is designed to generate the radio signal that is needed to interfere with the signal produced by a cell phone. The tuning circuit, on the other hand, allows the user to control the frequency the jammer uses to broadcast its signal. In order to control the frequency, a certain voltage is sent to the oscillator. The typical mobile phone blocker also contains a noise generator, which produces a random electronic output within a specific frequency range. This way, it can jam the cell-phone network signal that is part of its tuning circuit. Finally, the RF amplification component is used to boost the power of the radio frequency output. This boost is used to produce a frequency that is high enough to jam the signal. Of course, a mobile phone jammer also needs to have a power supply. In the case of smaller cellular phone jammers, the power supply is usually a battery. Stronger devices, however, may need to be plugged in or can be directly wired into the electrical system of a vehicle. Cell phone blockers come in handy in any location where cell phones have a tendency to create a nuisance. Similarly, some customers hold up lines as they try to complete their conversations. With cell phone blockers, this doesn’t have to be a problem! 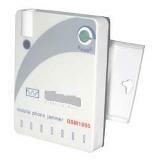 Corporates will find the Jammer useful as it will increase productivity & tackle security concerns. To learn more about how you can install a cell phone jammer at your location, contact at support@endue.in We look forward to helping you! To Keep An Area Clear Of Communication Signals? You Can Keep Signal Use To A Minimum! Depending upon the use of a cell phone scrambling device, it may be necessary to buy one with a great deal of power. With high power cell phone scrambling devices, you can jam a large area and prevent the use of cell phones. In fact, these high powered models can block cell phone signals in a space of up to one mile in diameter. With a special 3G jammer, you can be certain to block out all types of cell phones, while a GPS jammer can block out GPS signals as well. Obviously, not everyone is going to need a high power cell phone scrambling device to meet their cellular blocking needs. Since these locations are responsible for the safety of large numbers of people, using a high power cell phone scrambling device may be necessary to maintain security and guarantee the proper function of location-specific devices. In hospitals, for example, cell phone usage can cause a disturbance in the medical devices used during surgery. In military installations and on offshore oil platforms, they can serve as an ignition device that could lead to destructive consequences. Therefore, choosing the right device is essential. 1. How Cell Phone Jammers Work ? 2. Reasons to use Cell Phone Jammers. 4. Places where Jammers are useful. 6. Places where High power Jammers are Needed ? 7. Jammers can increase productivity. 8. Jammers can resolve security concerns. 9. Jammers in Meditation Centres.